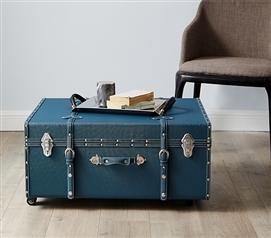 Trunks for college are a dorm essential for extra dorm room storage, but they can also add to dorm room decor too! Our Sorority College Dorm Trunk® comes in a variety of colors that you can mix and match with your dorm bedding or other college supplies. These college trunks have a ridged exterior for durability, handles, and the large size has two wheels for easy transport. Dorm trunks offer a great deal of dorm room storage to your college dorm room. 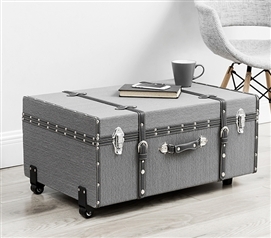 To really start college strong, a storage trunk for college is a dorm necessity that will add a lot of value to your dorm room decor and dorm storage. Keep your dorm room clean and organized with The Sorority College Dorm Trunk® in Ocean Depths Teal! Keep your dorm room clean and organized with The Sorority College Dorm Trunk® in Dark Gray Stripe! Keep your dorm room clean and organized with The Sorority College Dorm Trunk® in Taupe Gray Stripe! Who says trunks can't look good w/o costing a ton! The Sorority College Dorm Trunks® are durable dorm trunks for college that also look great. These storage trunks add a lot of value to your college dorm room. They add to dorm room decor, plus you can hide dorm items you may not use often such as seasonal clothes. Looking for somewhere to store your college textbooks? Yep, you can store them away in our Sorority College Dorm Trunk®. Add to dorm room decor while having plenty of additional dorm room storage space with this handy dorm essential!